See What’s New…mandalas for you to color for relaxation. Hospice" recorded in St John New Brunswick, Canada. Mask-making…continuing the arts in healing journey “Refirement” mask, reframing a notion of retirement and capturing the spirit with expressive arts. Explore your own "What's next?" Julia has been exploring the expressive arts in healing as another strategy to continue her mission to Respirit Reinspire Revitalize nurses. She believes the foundation of holistic nursing is holistic self care. This has led her to the bedside as an expressive arts facilitator in Hospice, to Certification in Expressive Therapies (CET®), to Arts in Medicine in a variety of settings, and to facilitating workshops and retreats on integrating the expressive arts for personal and professional development. The focus is the PROCESS not the PRODUCT. Everyone at the end-of-life has a need for the opportunity for life review and reminiscence. 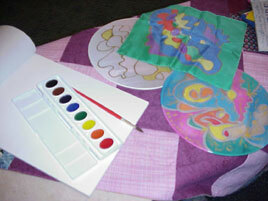 With this intention, the expressive arts facilitator can offer a time and space for this. For some clients, rather than working with the materials, we talk about the art in their life, such as their quilting, crochet, or making clothes. This generates reminiscence and a positive connection with their past, their accomplishments, and the gifts of love and time they have made over the years to their family and friends. If a client does not want to participate, I might leave an origami peace crane at the bedside, if possible, involving the client in the choice of a prayer, a blessing, or affirmation to be written on the crane. Nursing students explore collage for self-care. For Nurses---Nurses and others in the caregiver role can revitalize themselves and their practice through visual arts, journals, visual journals, poetry, storytelling, and contemplative strategies. Julia’s book, From the Heart to the Hands are stories of moments of connection between nurses and patients. A Coloring Book for Stress begins a journey to playfully explore self-healing. Lessons from my Cats and from my Life …a book of poems, invites others to share their own poetic expression. For Boomers---Looking for the What Next? as they prepare for the gift of an expanded life span, Julia offers retreats to explore life review, life repair, and the passion and mystery of the unlived life through an adventure in expressive art. Spend a weekend in a peaceful, beautiful natural space for reflection. Free to play and find joy. For Wild, Wonderful Women--- Where are you heading as life goes on? Consider images of aging and what it takes to become a wise, wonderful woman. Learn to use tools to tap your intuitive wisdom. Bring more adventure, passion, mystery, and meaning to your life. Create and connect in art play and process. 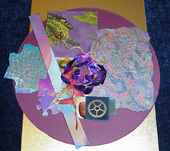 Collage, mandalas, journaling, poetry writing and to tap the inner muse. Build new relationships and supports for the journey to the authentic self. For the Endless Possibilities of our “WHAT’S NEXT’?